JR, The Black Entertainment Guide: Trey Songz calls Keri Hilson a "Great Glass of Wine"
Trey Songz calls Keri Hilson a "Great Glass of Wine"
Earlier, questions about the sexuality of Trey Songz emerged. This came after his very sexually-explicit album, Ready. 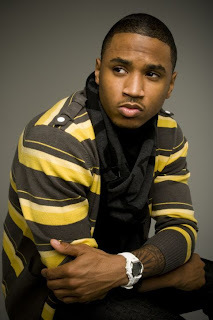 But, as the album's popularity has increased, it has become clear what Trey Songz likes and it is women. At the time when people were questioning his sexuality, Trey Songz said he had a relationship with Whitney Houston. For the past year, Trey Songz has been releasing singles off of his album, Ready. The album has been compared to the music released by R. Kelly during the late 1990s. Some people have said he has been trying to 50 Cent R. Kelly. Songz has been one of his more vocal critics and he has adapted elements of his style. Trey Songz has spoken on this multiple times and he said R. Kelly stole the style from another singer from the 1990s. Recently, Trey Songz was asked to rate some of the women in hip hop and R&B. Among the women he rated was his recent collaborator, Keri Hilson. On a scale of 1 to 10 he rated Hilson a 9. Aside from giving her a personal rating, Trey Songz also had a lot of things to say about her. Like many other heterosexual men on the planet, Songz is a big fan of Hilson's buttox area. He mentioned her thick things and wide hips, mixed with her height. This, along with her pretty face led Trey Songz to refer to Keri Hilson as a "great glass of wine." He would compare her shape to a wine glass turned upside down. Never one to shy away from his opinions, especially on a female, Trey Songz is a major fan of Keri Hilson.